Rasmus Dahlin met the media in Buffalo for the first time on Friday. Listen to what he had to say. 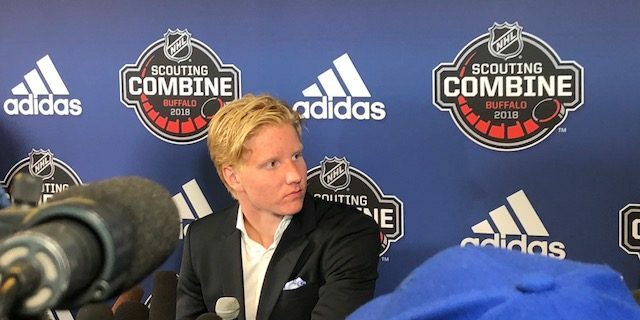 Likely Sabres top draft pick Rasmus Dahlin met the Bufffalo media on Friday as part of the NHL Scouting Combine. Looking sharp wearing a white button down shirt and sport jacket, the Swedish defenseman came across as confident and in control. He talked about being in Buffalo, a place he’ll soon call home. He also talked about his game, his influences and his excitement about starting his NHL career. For more on Dahlin’s debut in Buffalo, look for Budd Bailey’s column here on Buffalo Sports Page. For the scouting report on Dahlin from the NHL’s chief scout, Dan Marr, listen to Buffalo Sports Page Radio on Saturday morning from 10-12pm on WECK Radio 1230AM/102.9FM/100.5FM.